I’ve always had an obsession with stationery – whether I need it or more than likely not, I cannot resist a pretty new notebook, pen, washi tape or pretty much the entire contents of Paperchase and Smiggle combined. Whilst combing social media a few years back now, I happened upon Bullet Journals and knew I’d found the perfect way for me to take notes. 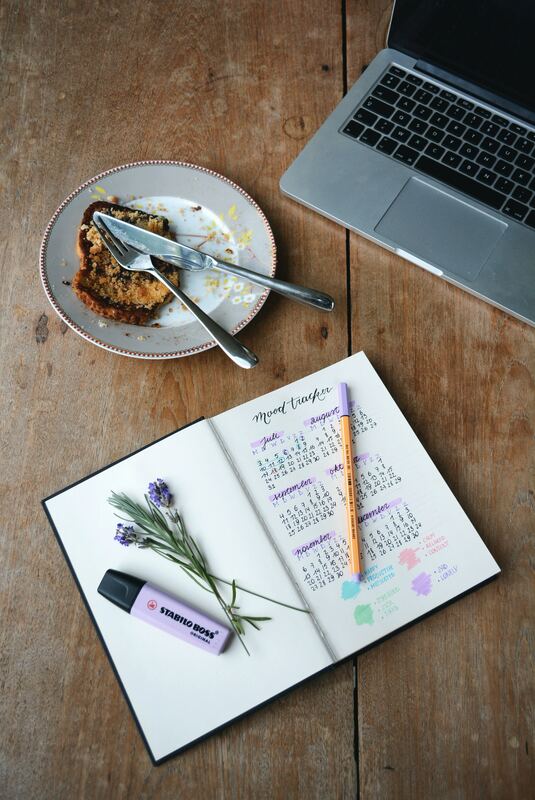 Despite living a very digital life, I am still very much about the pen and paper away from work and that is where my bullet journal comes in and is basically my life companion. 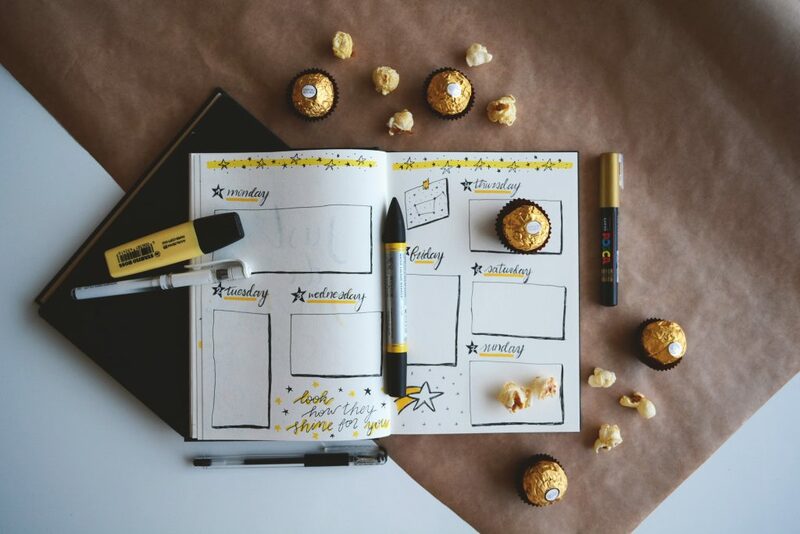 This post is here to tell you how to start a bullet journal and give you ideas, inspiration, layouts, spreads AND some free downloadable resources! I’m not being paid and haven’t been sent any of the products in this blog post, they’re simply ones I have bought and liked! A Journal – Now as I said you can technically use any notebook, preferably A5. They say the best ones to use and the one that I have is the Leuchtturm1917 Journals because they are dotted and can help provide guidelines for writing and decoration without being invasive like a lined paper journal would be. They are available in lots of colours AND have 249 pages meaning it’s going to last you a good while. Fine Liner – Get a pack of them because you will go through them. I started off with a back of black ones and then got some coloured ones as well because it is nice to use them to line everything and to write with. Pencil, Ruler and Rubber – Now this is where it depends how picky you are about it looking perfect. I like mine to look good and not like I did it in 30 seconds so when I am drawing boxes or trying a new type of text or image, I will pencil and ruler draw my things first so they’re all precise but that’s just me. You’ll want a 15cm and 30cm ruler or like me a folding one. Pens – You know all that swirling text you see in some bullet journals that is just beautiful? Yeah, to do that you need a set of Waterbrush Pens. Now, you don’t have to do this at all, again it depends on preference and if you’re happy with bubble and block letters you won’t be needing them. Decoration – Now this can be anything you like. I grabbed a really massive set of cheap stencils so I could easily draw lots of different shapes and decorations. I also got some stickers and some washi tape as part of a bullet journal gift which have been great fun to use. As long as it’s not going to bulk out your diary so it won’t close, you can stick anything in! What you do next is entirely up to you and why you want to bullet journal as each person’s is unique and tailored to them. 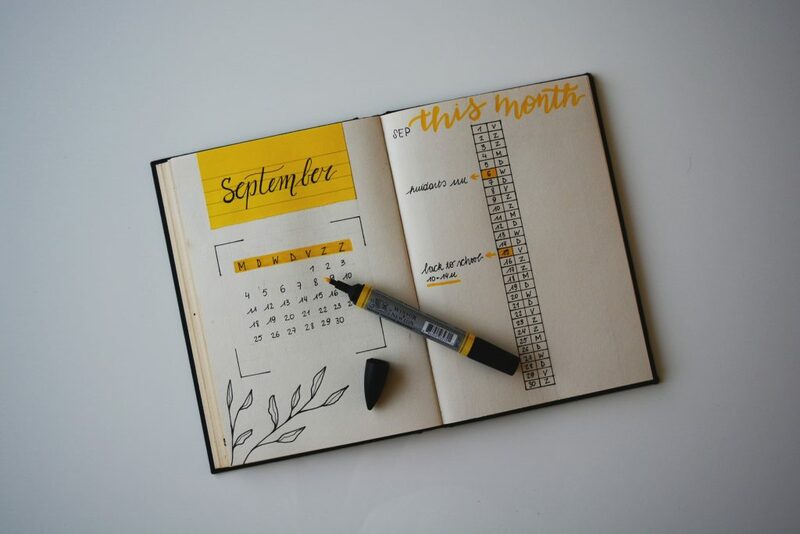 A suggestion would be to do a month in review page so you can make notes and plans for the month you are on like the one below. To go along with this, some people add a fitness tracker, weight loss tracker, lists of things they need to buy and do. Another couple of popular spreads are week to view, like you’d see in a normal diary as well as a meal planner, with what meals to have and a shopping list of what they need to buy. 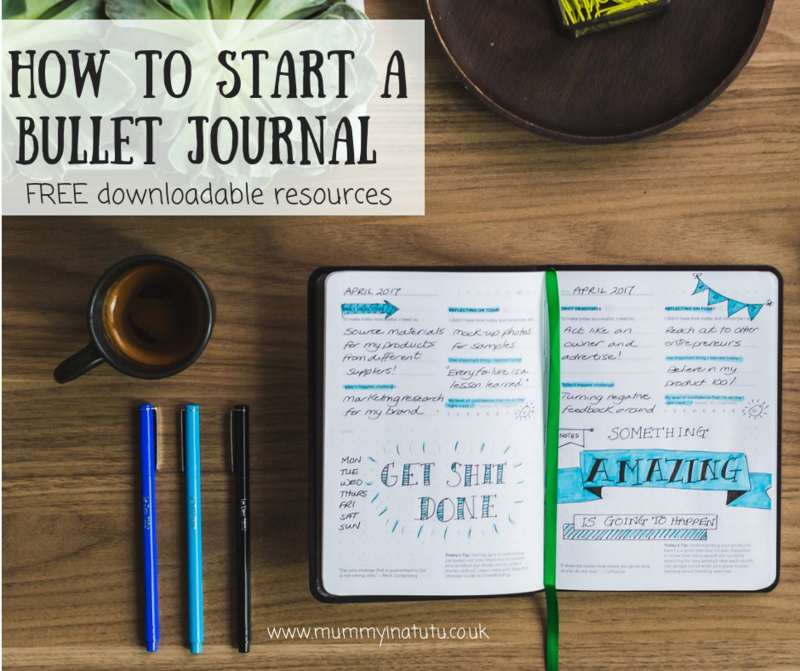 If you’re stuck for ideas on what to do or want some inspiration, then Pinterest is a great place to get some Bullet Journal Inspiration, plus I’ll be adding monthly inspiration and free resources to Mummy in a Tutu as well! 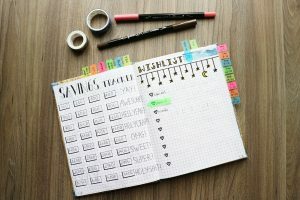 What you need to remember is that there is no wrong way to do a bullet journal. Each is unique and it is meant to be personal to you. I like mine because it is like having a diary, planner and space to doodle and word vomit all in one place. It does something for me that every diary and planner I have come across does not and PLUS it gives me an excuse to buy even more stationery and that is all the convincing I need. To help get you started I’ve put together this FREE RESOURCE PACK just for you with stencils and cutouts galore! Aren’t bullet journals great!! I love how you can customize it and change it up to suit what you need each month. My daughter does it too. Her’s is beautiful, mine’s king of a mess these days, ha. You make bullet journaling look so appealing. I must give it a try! I am also VERY committed to paper and pen. I keep a daily planner, and also a list journal where I write random lists and add to them as I think of things such as “What Love Looks Like.” Also I have a journal where I record thoughts that come to me when I read Scripture or occasionally other books as well. I think the act of writing things down slows our brain and helps us to be more focused. Your page layouts look fab! I tried bullet journaling last year, but it felt very fiddly. I do like some bits of it though, which I adapted into my planner. I’m thinking of giving it another try this year. Maybe I’ll keep it more functional – I think that may be more helpful for me!